If heating with natural gas isn’t an option for you, both oil and propane provide affordable alternatives for keeping your home cozy affordably. 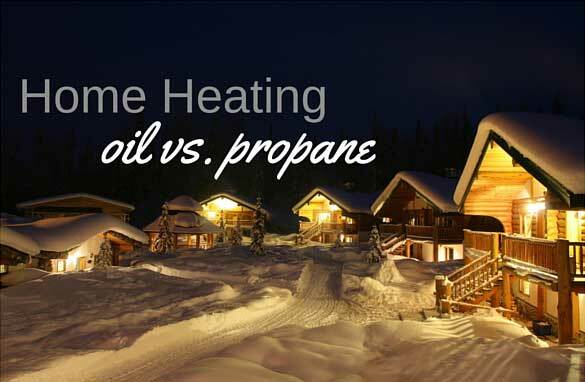 As with any heating method, though, oil and propane each have their benefits and drawbacks. Neither is always the best choice, so you’ll need an understanding of what each fuel has to offer in order to choose the one that best meets your needs. One of the greatest advantages of oil heating is safety. In fact, oil is the safest heating fuel choice available. Stored oil isn’t easily combustible and ignites only thanks to the burner system inside the furnace or boiler. Even if oil does catch fire, it won’t explode the way propane can. Heating oil fumes aren’t lethal, so you and your family are unlikely to be harmed in the rare case that an oil leak occurs. Fumes from a propane leak, however, can quickly prove fatal. While both oil and propane systems carry a small risk of harmful carbon monoxide (CO) leakage, oil systems give you plenty advanced warning of problems in the form of smoke and soot. A propane system can leak CO without any prior signs that something’s wrong. Comfort is another consideration. Oil burns hotter than propane, so it heats up a cold home more quickly. If you live in a cold climate or prefer a more intense heat in your home, an oil furnace is likely to keep you more comfortable than a propane model. Although older oil furnaces had a reputation for being noisy, modern systems are quieter. If you already have an oil furnace, it’s usually more economical to upgrade to a new model that’s more energy efficient and quieter than it is to convert your home to propane heating. Energy efficiency is another critical consideration when choosing a heating fuel. High-efficiency furnaces are available for both oil and propane, but in general, propane systems reach higher efficiencies than oil models. The AFUE (Annual Fuel Utilization Efficiency) of most new oil furnaces is 95 percent, while propane furnaces reach AFUEs of up to 98 percent. Propane systems average around 10 to 15 percent more efficient than oil systems. Not only are propane heating systems more efficient than oil models, but propane is also a more environmentally friendly fuel. Propane releases around 24 percent less CO2 than oil. It’s so clean it’s been approved as a “clean fuel” by the U.S. Environmental Protection Agency. Although oil contains more BTUs of heat per unit than propane, that doesn’t necessarily make it cheaper for heating a home. Because propane systems are typically more efficient at extracting heat than oil systems, heating with propane is usually cheaper than heating with oil. To choose the most cost-effective option for you, you’ll also need to know the fuel and delivery costs in your area. These vary by location. Price fluctuation is another factor. The cost of propane is relatively stable. In contrast, oil prices are influenced by world events, so they’re less predictable and are subject to sudden, unexpected increases. In addition, a propane system offers the benefit of simpler installation and maintenance compared to an oil system. An oil-fired system requires either a direct vent or a chimney. A propane system can be vented through PVC pipe, which costs less, is easier to maintain, and is less visible on the outside of your home. The best heating fuel choice for your home depends both on your priorities and your local fuel costs. If you’re considering upgrading your current system or installing a new one, a heating equipment dealer can help you weigh the pros and cons of each one.